Yup, it makes your flies glow. There’s been a lot written in the how-to fishing world recently about light and colors, how light is absorbed, how certain colors dissipate in different water conditions and depths, how fish see colors, and how all that thinking can be applied to lures and flies. In a nutshell, the deeper you go, the grayer things look. Using “hot spots” and fluorescent accents on flies is thought, by some, to enhance appeal. 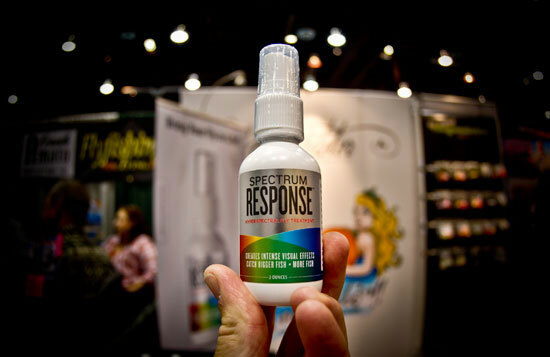 We’ve seen a few products at IFTD that specifically factor in hot spot thinking, but our favorite so far is a U/V spray distributed by Westwater Products called Spectrum Response. Squirt it on a fly, and it causes the treated materials of that fly to absorb radiation in the ultraviolet region of the electromagnetic spectrum, and re-emit light in the ultraviolet regions of the spectrum. Fish see the fly better, so they eat the fly better. It’s non-toxic, it works in freshwater and saltwater, and it’s hydrophophic, so it lasts. It also doesn’t gum up your flies with resins. It’s available in a 2-oz. tube for $19.95, and a 1-oz. tube will also soon be available for $12.95.